In tonight’s season finale of Arrow, Oliver Queen faces off with big bad Ra’s Al Ghul, who has plans to destroy Starling City. (Being an insurance adjuster in that town must be quite the lucrative gig.) 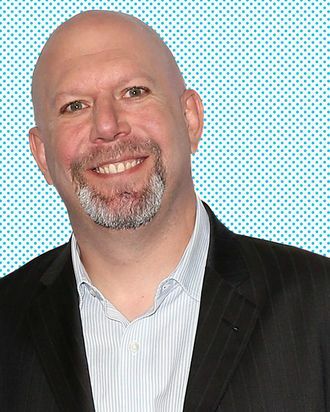 Ra’s isn’t the only one looking to make big changes: Arrow showrunner Marc Guggenheim promises that tonight’s episode will “blow up” the show as fans know it. “By the end of the season finale, people are going to think, Holy heck, how are they going to do this show anymore? I’m a big fan of the shows that can blow themselves up and then reconstitute themselves.” Before Guggenheim hit the detonator, Vulture spoke with him about his reflections on season three — the risks and challenges — and how Oliver nearly missed being kicked off that cliff. Season three has been a big year for Oliver in terms of growth and coming to terms with his identity as the Arrow. Besides Oliver, which character do you think changed the most this season? To me, it’s a photo finish between Felicity and Laurel. Gosh, and Thea, too. I think all of our female characters really went through something this year. With Felicity, I feel like she really found her voice in the lair. Unlike seasons one and two, where Felicity was just kind of quietly pining after Oliver, I think she had more of a point of view this year. She was willing to go toe-to-toe with Oliver a bit more. And Laurel obviously took this huge leap forward in becoming the Black Canary. That was one of our riskier moves. We took this character who is basically an attorney and turned her into a superhero. It was tricky to do that within the confines of the reality that we’ve set for the show. Sara’s death in the season-three premiere is the catalyst for Laurel’s transition to Black Canary, and that death seemed to set a dark, more philosophical tone for the season overall. Was the darker tone a purposeful choice, or did the themes you were exploring, like identity, simply tend to favor that direction? It really just tended to favor that direction. We didn’t set out to make the season dark. It really wasn’t until the end of season three that I started to realize, “Oh, when you look at the gestalt of the episodes, they’re pretty dark.” When you start a season killing off a character, it’s going to have that effect. The one thing about Arrow is we’re not afraid of the dark. This is a show where at the end of an episode’s second act, you have the protagonist breaking someone’s neck just to keep a secret. It’s a dark show. That’s sort of where we oftentimes find ourselves trafficking. That said, if the whole season is a piece of music, we definitely started off by hitting a minor key. I personally loved the darker material. If season three had just been a simple repeat of seasons one and two, that would have felt unsatisfying, even though I enjoyed those seasons. There has to be change. There’s evolution, but there’s also flexibility, which I think Arrow does really well — like choosing to make Emily Bett Rickards a series regular in season one. What kind of flexibility was there in season three? Where did you deviate from the plan? The idea of having Oliver be stabbed and kicked off a mountain [in the mid-season finale] — that wasn’t part of the game plan. That was something that was a relatively late discovery for us. The season ends the way we had always anticipated and planned out, but our route getting there was a little different. What made you go the stabbing/kicking route? It was a combination of a couple of things. If Oliver is going to have his first fight with the big bad of the year in the mid-season finale, which is what we had set up, it was first a question of, how do we have that fight unfold in a way that’s unexpected? By doing what we did, it opened up this possibility of Ra’s offering Oliver the mantle of Ra’s Al Ghul, which satisfied another problem we were struggling with. We knew that Ra’s at the end of the season was going to try to destroy the city. That’s what our big bads tend to do. But, in season three, how do you keep things fresh and new? One thing we hadn’t seen was the big bad try to corrupt Oliver. We hadn’t seen the big bad say, “Take my hand and come to the dark side.” That was a very exciting discovery for us. For a while this season, I wasn’t sure who the big bad was supposed to be. In the first half of the season, Malcolm, setting up Thea to kill Sara, made Ra’s seem like a puppy. But, in the back half, Malcolm’s trying to make amends and Ra’s is at his worst. So was Malcolm a red herring? Or is he just the “little” bad that just kind of hangs around? I love the fact that we’re always wondering where Malcolm stands and what he’s up to. He’s such a rich character. We never really intended on him being the big bad of the year because we had done that in season one. I will say that the conclusion of Malcolm’s story in the season finale is exactly what we always had planned from the very beginning of the season. I’m really looking forward to people’s reaction to the end of that story. Was there a character or story line that you think fans misunderstood, in terms of the show’s intentions? At the top of the list is the Oliver-Nyssa wedding. If there’s ever an example of people missing the point, it was people outraged that our villain was forcing his lesbian daughter into a marriage with a straight man. I should point out it wouldn’t be okay if he were to force his lesbian daughter into a relationship with a lesbian woman if the daughter didn’t love the woman. I think a vocal minority on Twitter and Tumblr read a political statement into that story line where none was intended. That was the last thing I was expecting, especially because everyone on the show is so pro-marriage equality. To have our work interpreted as being antithetical to that was pretty surprising. The bad guy was doing something bad. Some people were thinking we were somehow making Nyssa straight as a result of the story line. Being married does not change your sexual orientation. I’m glad, though, that the show can engender passionate debate, and I’m glad that we have fans that are so pro-LGBT rights that they can get angry about these things. One of my favorite developments in season three is the introduction of Maseo and Tatsu, both in the Hong Kong flashbacks and present day. Excellent casting. For me, one of the really lovely surprises of season three is how much the audience has responded to both those actors and characters. That was really gratifying. I hope the season finale gives a proper send-off to those characters, because it’s been so much fun to write for Rila [Fukushima] and Karl [Yune], and knowing whatever we write for them they were going to knock out it of the park. They were the two big surprises of the year. Every year we plan as much as we possibly can, but we’re really banking on the unexpected finds, either in terms of casting or story choices or both, to help push the season over the top. What’s the lesson that you learned from season three that you’ll be carrying with you into season four? Every season you learn something. I think, for us, we got as tired of the doom and gloom as everyone else. By the end of the season, we in the writers’ room were all craving a lighter tone. I don’t think the show will ever be as tonally fun as The Flash. They’re Metropolis, and we’re more Gotham City. But at the same time, there’s a desire on our parts as writers to move our characters into a happier place. So … the lesson wasn’t that the show should have more scenes with Stephen Amell shirtless? [Laughs.] That’s something that’s been discussed. We’ve got some stuff in place that will probably deliver more shirtless Stephen Amell scenes to you next season.